There are plenty of ways for youth to get involved! 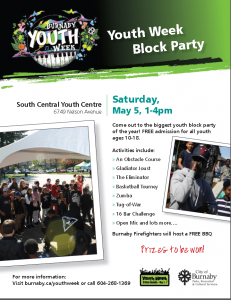 Be sure to mark your calendars for the beginning of May and join in fun events dedicated to youth held throughout the entire city. If you want to get involved right away, a Youth Week organizing committee plans the celebrations and can always use a helping hand. Youth Week is also a time that the City recognizes the achievements of our youth with the Burnaby Youth Week Citizenship Awards. Teens are recognized in an official ceremony during Youth Week. If you know anyone who deserves a Citizenship Nomination, contact any Youth Centre or your school teacher for more information and deadlines. Deadline for this year’s nomination forms have past stay tuned for more information to come winter 2019. Top nominees are awarded $100.00. PS The artwork on all the posters and promotional material for Youth Week were created by our very own Phoebe Qian!